Home What are Seed Balls? A pile of seed balls. What are seed balls and seed bombs? A seed ball (or seed bomb) is a seed that has been wrapped in soil materials, usually a mixture of clay and compost, and then dried. 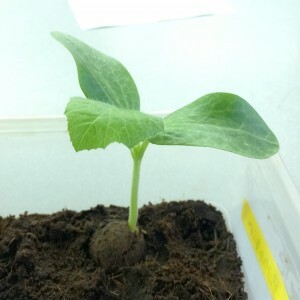 Essentially, the seed is ‘pre-planted’ and can be sown by depositing the seed ball anywhere suitable for the species, keeping the seed safely until the proper germination window arises. Seed balls are an easy and sustainable way to cultivate plants in a way that provides a larger window of time when the sowing can occur. They also are a convenient dispersal mechanism for guerrilla gardeners and people with achy backs. 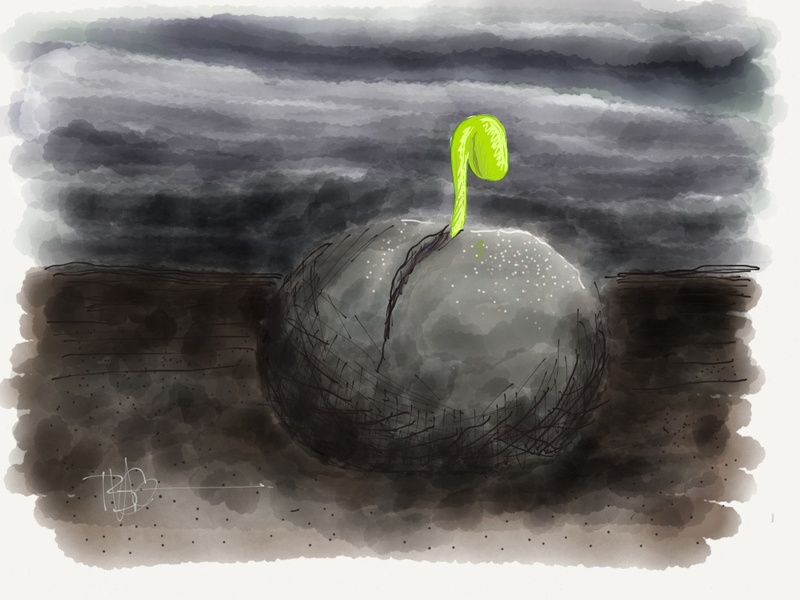 A seed ball before the storm. 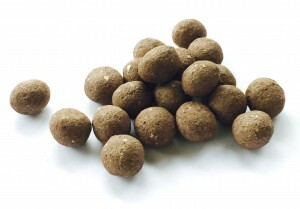 Seed balls may have been used by the Ancient Egyptians to seed the receding banks of The Nile after annual floods. They have been used in Asia and elsewhere, especially in arid regions, because of their ability to keep the seeds safe until conditions are favorable for germination, and the ease at which they can be distributed. In the Carolinas in the 1700’s, West African slaves, predominantly women, were brought in to cultivate rice using a seed ball technique that was used in Africa. Rice seeds were coated in clay, dried, and pressed into the mud flats with the heel of the foot. This served two purposes, protecting the seed from the birds, and also preventing it from floating off when the fields were flooded. I am surprised that this is not mentioned more in the online seed ball literature. I plant to write a more lengthy post about it soon. A pumpkin seed ball growing in our lab. 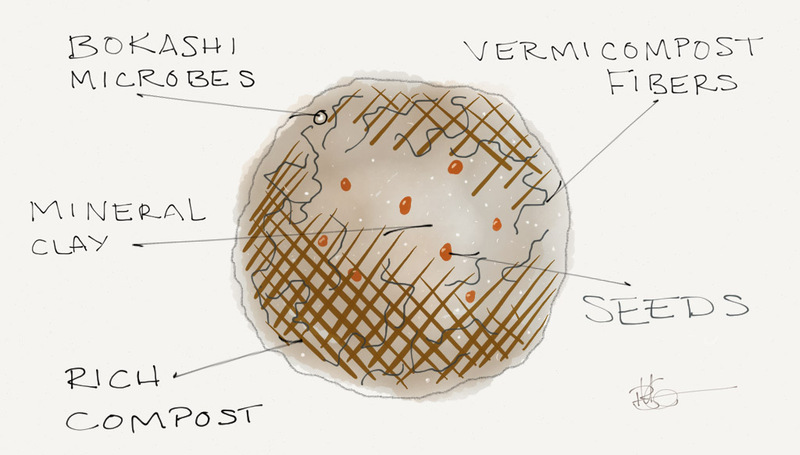 More recently, Japanese agricultural renegade, Masanobu Fukuoka, began exploring the use of seed balls (nendo dango in Japanese) to help improve food production in post WWII Japan. His research and outreach efforts has brought the seed ball back into the public eye. 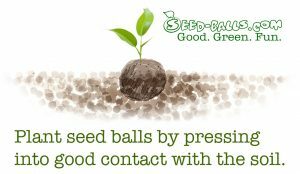 Today, seed balls are fun for green-minded kids and adults, and are also an important tool of the guerrilla gardening movement. Our seed balls/seed bombs are individually made in our Pennsylvania greenhouse. I like to think of them as the Ferrari of seed balls. They contain a combination of mineral soil and three types of compost. Read about the science behind our formulation on our science page. Seeds are scarified if necessary prior to placing in the seed ball. Depending on the size and requirements of the plants, seeds are either mixed in with the soil before the seed balls are made or placed individually within the moist seed ball. We carefully hand roll each seed ball until it’s just right. The seed balls are then air-dried, providing a safe haven for its contents until germination. Our seed balls are packaged in a small recyclable brown paper bag. Nothing fancy, nothing that leaves an unnecessary footprint. Press them gently on the soil, about 2/3 of the way down. For added fun, throw them along the road, use a slingshot, or a boilie thrower. 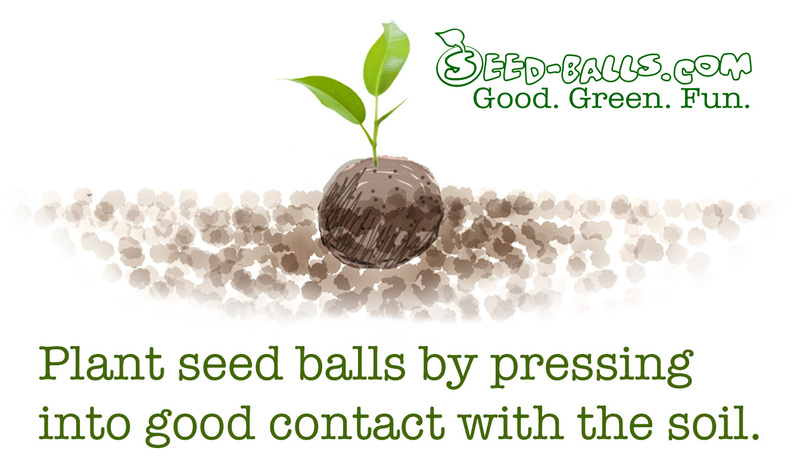 We test our seeds for germination and make certain that our seed balls have excellent viability when the environment is favorable. Our seed ball matrix is designed by Dr. Blake Ketchum and Biologist, Brian Moyer. Blake’s got a PhD in Soil Science and is nuts about soil and plants, Brian has totally got the mad experimental scientist thing going on! We use 3 kinds of compost to super charge our seed balls for all the nutritional requirements of your plants. Seed Balls vs Seed Bombs? The only substantial difference is what you call them. “Bomb” sounds more subversive, and so it’s gaining popularity among guerrilla gardeners. When properly made, the seed ball or bomb will have enough seed to ensure germination, but not so many seeds that the plants will choke each other. Since the idea is to grow healthy plants, we use enough seed to ensure good likelihood of germination, but not so many that the seedlings are stressed from crowding and fail to thrive. Some folks who make seed bombs overload them with seed. They look like chia pets when they germinate, but the competing seedlings may not do so well. Don’t sow in others’ gardens or crops. Never plant invasive species. Look it up at the Biota of North Ameria Program. Don’t disturb pristine or vulnerable ecosystems with non-native species (see link, above). And… don’t throw seed balls at siblings or animals (or people, vehicles, buildings, etc. ).